Grapevine Guest Suite offers complete privacy in the heart of historic Hermann — the entire property is yours to enjoy. It’s the perfect spot for couples seeking some special time together. Whether it’s your first weekend getaway, or your upteenth wedding anniversary, the Grapevine Guest Suite will deliver a memorable stay. The bedroom features a California king bed and sitting area with cable television. A gas fireplace in the bedroom provides romantic warmth in the fall & winter. TV has a DVD player and movies. The bathroom has both a 4×6 jacuzzi tub (room for two!) and separate walk-in shower. The fully-equipped galley-styled kitchen has everything needed to make a cup of coffee or prepare a light meal — includes dishes, glasses, microwave, coffeemaker, toaster, etc. 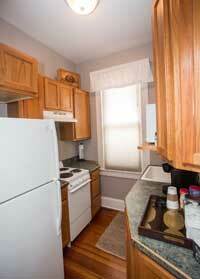 Kitchen is stocked with complimentary Keurig coffee bar, tea, bottled water, soft drinks & snacks. A private patio, complete with table & chairs, gas grill, fire pit and carriage lights, is perfect for enjoying an evening glass of wine and cooking up some local brats. A dozen eating & drinking establishments are within easy walking distance. “Shoppers’ Row,” along Schiller and Fourth Streets, offers ample browsing opportunities for antiques and collectibles. The Hermann Trolley can pick you up curbside!